It’s the pre-week of school and I just returned from doing some school shopping at Staples. I think everyone in Augusta County was shopping – getting ready for school, and the kids – so excited about returning to a new year of school. What a great feeling when a student runs up to you sharing their excitement! Kind of makes us excited too, doesn’t it? With vacations over, teacher workdays beginning, and the first week of school just around the corner, all I can say is here we go again. It's hard to believe, but the bells are ringing and the hallways are filling up with students rushing from one class to the next. You're probably rushing from one task to the next as well; from planning lessons, to scheduling trips, to fine-tuning your lab equipment. 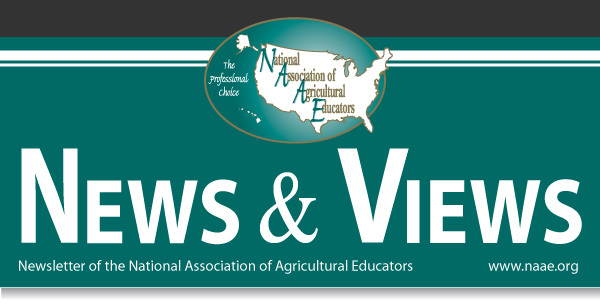 NAAE has taken the lead role a national effort to recruit agricultural educators, the National Teach Ag Campaign. The campaign is an initiative of the National Council for Agricultural Education's 10x15 Teacher Recruitment Task Force. Jon Derek Mitchell, the ag teacher at Chattanooga High School in Chattanooga, Okla., developed a creative, hands-on method to teach greenhouse management that won the Region II Ideas Unlimited award last year.